One of the unique features of this website are the original pieces of artwork that I have created to illustrate my fanfiction. I don't think there is another web-author out there who has taken on the task I have accomplished here. It there is,please tell me how you did it because I'm going insane just trying to pull off the goal I have set for myself. If you are reading this page, you have probably at least a passing interest in how I went about making the illustrations I have used. As you may surmise, it all begins with the story. Writing, while fun, does not come easily to me. Yes, I can type up various ideas and scenes with dialogue between the characters. It's the editing that I find difficult. I tend toward the verbose, and keeping chapters to a "reasonable" length is a struggle for me. The voices in my head are say so much more than I can put down into print, and the ideas don't always come to me in order, so there's a good deal of organizing in this process. Once the story is finally finished, I often spend weeks agonizing over which moment of each chapter to illustrate. With a few thumbnails sketched out, I then surf the internet for photos of the various actors, hoping to find them posed in a similar manner. It's seldom a perfect match, so there are , as well as peruse the mountain of magazines and books that I have collected on the subject of Buffy. At that point, I begin my sketching. A good many of these first pieces end up in the trash, but a few promising ones eventually make it to the next step. In my initial stories, I worked exclusively in pencil with ink accents. You will find these illustrations accompanying the two versions of my story Youthful Indiscretions. ( See Season Three under "The Buffy Years" ) When I decided to start the ReVamp'd Series, I added color to my work. 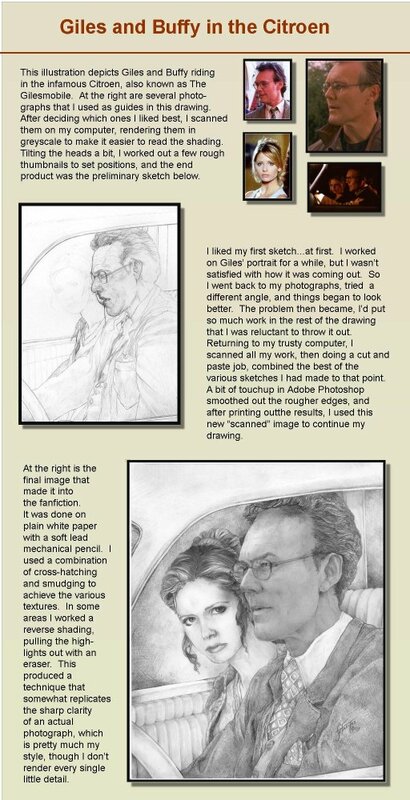 It made the creative process a little more challenging for me, but I felt I was competing with other authors who used manipulated photographs on their sites, so I gave it my best effort, and I feel the result speaks for itself. Besides the art featured in my stories, I've included a few additional examples of what I can do. You will find various monsters and fantasy creatures on these pages, as well as a few carousel animals I have designed. I hope that you enjoy viewing these artworks as much I have had fun in creating them. This first section is a small sampling of my illustrations in various stages of their creation. I have presented them along with the photos that I used as my guides. A brief overview accompanies each work. These are presented in the original black and white pencil, but for my fanfiction, I adjusted the tinting with Photoshop, and then scaled the size down to fit the pages. Most of these originals are 8X10 inches, or thereabouts in size. To view the enlarged page, please click on the thumbnail. From there, you may need to enlarge the view again to fill your screen in order to read the print. A few more sketches that have been tinted from the original black and white. These come directly from my story Youthful Indiscretions. 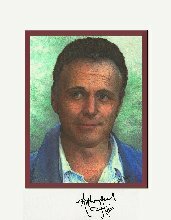 The first potrait of Anthony Head I did for a Buffy convention in Cleveland, Ohio. It was signed by the actor himself. 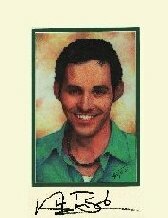 At that time, I did another portrait of Nicholas Brendon, which I also now have framed for my walls. 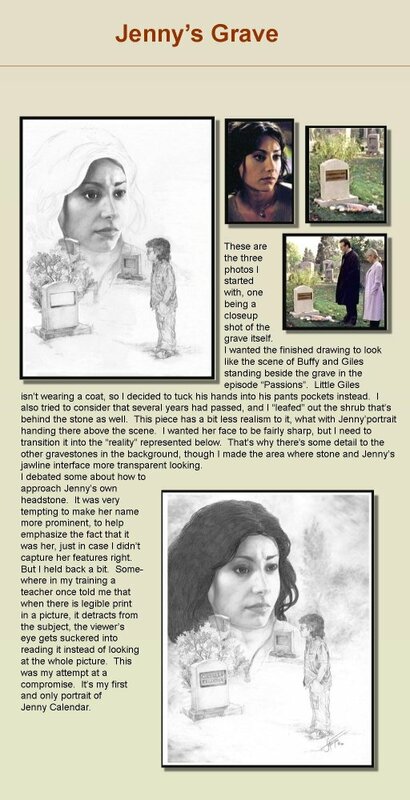 The remaining illustrations are cropped from pieces intended to accompany my stories for Buffy and Giles: ReVamp'd. These are desktop wallpapers, banners and various images I've created that can be used on a computer. At present, I only have a few pieces to share, but please feel free to download and borrow what you like. Several years back I attended my one and only Buffy Convention in Cleveland, Ohio. I decided rather than bring home the standard studio photos with the stars' autographs, I wanted something more personal to remember my visit. Thus, I came up with the idea of doing my own portraits for two of the major stars scheduled to appear at the function. The final products featured Nicholas Brendon and Anthony Stewart Head., and I'm very proud of how the portraits turned out. The final artwork was done with Prima color pencil on a transparent vellum paper. This is a technique that I discovered back in my student days. I like using the transparent vellum because I can apply the color to both sides. This allows the more muted color from the back to subtly glow through the color on the front. The effect creates a depth with tones that are less glaring and obvious, and I feel more lifelike, especially when applied in the context of skin tones. I always felt that simply adding some pink to the flesh on top looked like the sitter was wearing poorly applied makeup, but when coloring from beneath, the underlying "blush" that comes through looks more natural, as if it were reflecting the blood beneath the surface,. The technique also is useful when trying to achieve a subdued reflective shadow, or when adding more depth to an already dark surface shadow. It also just lends a certain richness to the hues within the work. Plus, I think it looks nicer, and I guess that's what counts in the end. Here you can find creatures and people of mythical origin. It's sort of my attempted homage to fantasy art. I've always enjoyed the work of Boris Vallejo, Frank Frazetta, Greg and Tim Hildebrandt, Julie Bell and Heinrich Kley. I love carrousels. I've alway wanted to do a series of these imaginary pieces. Here are some pencil designs I've worked up. Please click on the thumbnail to view an enlarged version.